Poland is, I think, the second country which issued the greatest number of stamps on late Pope John Paul II, after the Vatican, with the first issue dating back to June 1979 and the latest one to April 2005. Karol Józef Wojtyła (1920 - 2005) was from Wadowice, a city in southern Poland. He became Pope on 16 October 1978 and passed away on 2 April 2005. He was the second-largest serving Pope in history and the first non-Italian since 1523. John Paul II was doubtlessly the most appreciated Pope ever and one of the most influential leaders of the 20th century. He also visited 129 countries, beatified 1,340 people and canonised 483 Saints during his pontificate. 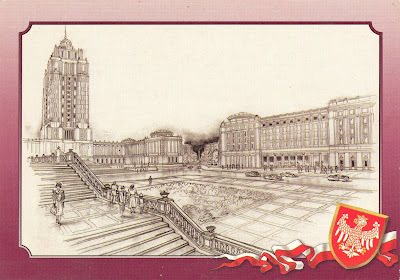 The 80GR stamp above (second from the right) was released on 18 May 1995 to celebrate the 75th birth anniversary of Pope John Paul II and the 1.30zł one on 8 April 2005 on his death. To view all the postage stamps about Pope John Paul II issued by Poland, click here. 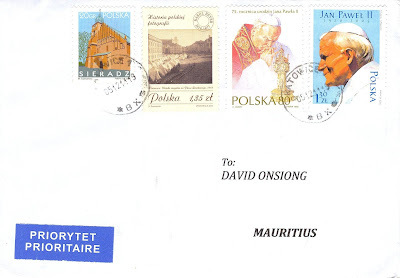 Mauritius also issued a set of stamps, on 13 October 1989, for the Visit of the Pope in the island, click here to see it.